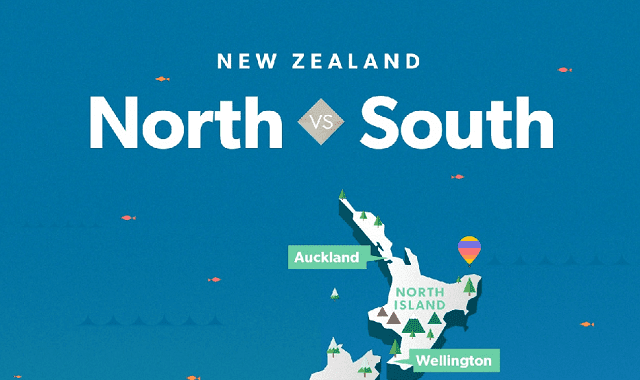 New Zealand: South Island Vs. North Island? #Infographic ~ Visualistan '+g+"
“North Island versus South Island. It’s no surprise that there is a friendly rivalry between New Zealand’s two halves. The country is known for its diverse and epic landscape, which in a comparably small space to the rest of the world, varies so dramatically from north to south. Both islands’ patriotic locals will be hell-bent to convince you that their slice of land is the supreme. So which is better? To try and settle the argument, Cheapflights have published this handy infographic, detailing the main differences between the North and South Islands. Comparing the likes of population, landscape and recreation, they’ve delved deep into the nitty gritty of what makes these islands stand apart.